Not many Malaysians and visitors realise that less than a 2-hour drive from Kuala Lumpur, the capital city, there is an island that is home to reportedly the world’s oldest recorded and still very much alive culture. The island is called Pulau Carey (Carey Island), which is located along the coast of Selangor, and the distinct culture and traditions belong to the Mah Meri tribe, one of the 18 tribes that have been recognised as “orang asal” (or aborigines) of the Peninsular Malaysia. A subgroup of the Senoi people, the Mah Meri tribe is made up of descendants of sea gypsies who originally lived off the sea. Today, they form a small group of about 4,000 and live along the coastal areas of Selangor. Pulau Carey alone is home to five separate villages of the Mah Meri, each with its own Tok Batin (village head). Kampung Sungai Bumbun, the main village, is also home to Mah Meri Cultural Village, the place to go and see (and learn) how the tribe lives according to their age-old culture and traditions. Personally, I’ve only got to hear about the Mah Meri tribe, for the first time, just a few years back. My first encounter with them was during Citrawarna 2014 (Colours of Malaysia parade) in Kuala Lumpur when a group of them performed their traditional dances at the parade. The closest I’d been to Pulau Carey meanwhile, was when I went paragliding in Jugra, Selangor in late 2013. I could see the island just across the river down from Jugra Hill. That was basically it, my “experience” with the Mah Meri. I was thus very excited when I got to join a trip, aptly called 'Rentak Selangor' (Rhythms of Selangor), organised by Selangor State Government & Gaya Travel magazine to explore the various (musical) cultures of Selangor, and it included that of the Mah Meri tribe. Travelling on the chartered bus to Kampung Sungai Bumbun, I didn’t even notice that we’ve crossed over to the island from the mainland as they are separated only by a narrow river. What was noticeable though, the kampung (village) environment – narrow road, palm trees (and the palm oil trees further beyond), wooden houses and local kids, either walking or cycling in a group. Our arrival was greeted by the village dance troop and each of us was crowned with a handwoven headgear called songkok. A small prayer ceremony followed, led by the village Tok Batin in the compound of the Craft Centre, to ask for the blessing of tribe’s ancestors. The Tok Batin then proceeded with a briefing in Malay – although, among themselves, they speak their own tribal language called Mon-Khmer - to give us a quick glimpse of their history and lifestyle. Soon after, they started to perform traditional dances, including the popular 'Main Jo-oh' - believed to be “the only mask dance practised by an indigenous community in Malaysia” - in which a group of Mah Meri women, in their tree bark dress, palm leaves skirt and plaited headdresses, are joined by 2 men, who dress similarly but wear intricate wooden masks of their ancestors. The dance, accompanied by a band playing traditional instruments: tun-tog (bamboo), jule (viola), tambo (drum), and a-tawa (brass gong), basically is a re-enact of everyday life of a Mah Meri, and the women do it to invite the men with the mask, who represent their ancestors’ spirit, to join in the party & celebration. The masked ancestors’ spirits eventually do, but not without some antics, as both of them have their own stories too. One of the masks represents the spirit of Moyang Pongkol (moyang means a great-grandparent or ancestor), who takes pleasure in making people getting lost in the jungle, thus the dark look with the unsmiling feature, and the name ‘Pongkol’. The other mask represents the spirit of Tok Naning (tok = grandparent), who likes to eat and pick things up whilst walking around – the reason why it has a basket (called gaye) on its back, a nice round belly and a happy face. Sazali & Alias, the guys behind Moyang Pongkol and Tok Naning respectively. 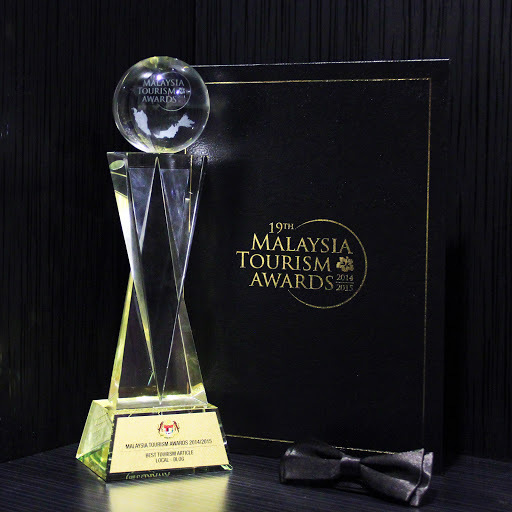 Together, Moyang Pongkol and Tok Naning simply stole the show. These traditional dances are usually performed during Hari Moyang (Ancestors’ Day) and at weddings. If you’re lucky, you might be able to catch them at special events too, like Citrawarna in Kuala Lumpur, or even somewhere outside Malaysia. As it happened, some of them had just come back from Morocco after a cultural showcase over there. Every year, about a month after Chinese New Year, the Mah Meri tribe celebrates Hari Moyang, a day to appease the spirits of their ancestors. It is a day of grand celebration that is steep in tradition and reportedly comes heavy with traditional music and dance. The celebration is open to the public and thus, is probably the best time to visit for anyone who is interested to watch and learn the Mah Meri culture. As our visit was off by a few weeks, we didn’t get to see this. However, we did pay a visit to one of the three Rumah Moyang, which is located further inside a palm oil plantation, near a river. The hut, filled with some offerings and dedicated to a female spirit guardian called Moyang Gadeng, is guarded by wooden statues of 2 tigers, which, according to stories, represent the tigers that were adopted as sons by the childless Moyang Gadeng. Unique dance rituals and Hari Moyang are not just what the Mah Meri tribe is well known for. They also have a reputation for their traditional wood carvings and is said to produce some of the world's finest wooden masks. As we walked along the narrow village road, we noted that there are huts outside some of the houses. These huts are where the villagers create their masterpieces, whether in the form of wooden masks and statues; or woven baskets, mats, and accessories made of pandan leaves. As our visit was pre-arranged, we got to see some craftsmen working on their carvings and pandan weaving. If you happen to see some of them working in one of these huts, do take the opportunity to have a closer look and even have a chat with them. The artisans here do take pride in their work (and rightly so too) and would be more than happy to tell you stories behind their creations and masterpieces. Just like the masks of Moyang Pongkol and Tok Naning, and the tiger statues at Rumah Moyang, each mask and wooden statue comes with a story; stories that would make you understand and appreciate these masterpieces better. And perhaps even make you fall in love with them, enough to make you want to bring one or two pieces home. 1. Do contact Mah Meri Cultural Village/ Pusat Kraf Orang Asli Sungai Bumbun before visiting to check their current dance performance timetable at the village. 2. While the main attraction here could be the traditional mask dances, a visit here could still be worthwhile even when the dance group is absent/away. The Mah Meri Cultural Village Museum has displays of Mah Meri art and a gift shop too. 3. There is no public transportation service to Pulau Carey so the only options you have is either to drive there on your own or take a taxi (either from Kuala Lumpur or Klang) or take a tour package. 4. 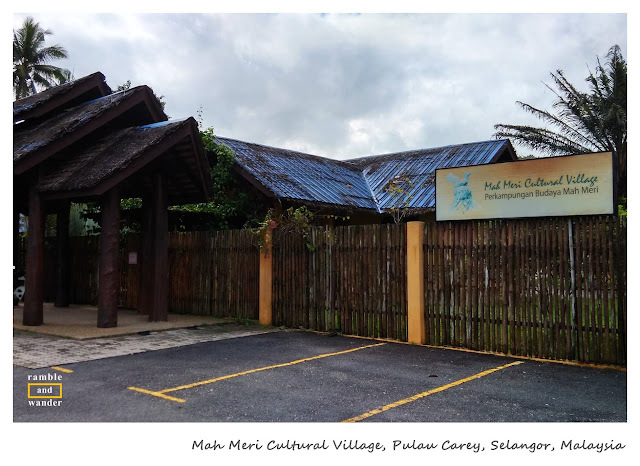 If you’re travelling in a big group, you could try to ask Mah Meri Cultural Village/ Pusat Kraf Orang Asli to organise a tour around the village. Have you been to Mah Meri Cultural Village? Or have you seen they performed their dances somewhere before? What are your thoughts on them? If you haven't been/seen them, have you been to see any similar aboriginal tribe elsewhere before? Where was it? We stayed at Qliq Hotel during this Rentak Selangor trip. You can also check out these hotels for your accommodation requirements there. Wow! I've never even heard of this culture. This is what I love about travel and reading travel writing. Yes, I can imagine that. Even most locals I've talked to about Mah Meri tribe have never really heard about them. That is despite their place being less than a 2-hour drive from the capital city. Ha! Interesting! I was just talking to a friend who's born and bred in Selangor and he's never heard of the Mah Meri too. What an incredible place to visit! They have preserved their culture so well, it would be a delight to watch all the traditional dancing and see the artwork. Hi Vicky, it was really interesting to see them preserving their culture despite the onslaught of modernity and foreign culture that surrounds them. I personally would love to go and see how they celebrate Hari Moyang one day. Interesting. I have been hoping to visit and see them up close! Ruginya tak dapat join Rentak Selangor that day. Uargh! Ah-ha! They're the main reason why I registered for Rentak Selangor, heh! But as it turned out, I did enjoy other new "discoveries" too throughout the trip. Apa kata pergi sana waktu Hari Moyang? I've been to Malaysia several times and I had no idea about this. I will have to make sure to visit this island next time I'm passing through KL. Also, great photos! Thanks, Nathan. I'd never heard of them myself, until a few years back. If you have the chance and time whilst in KL, do head over to their place. Thats a beautiful discovery for me. I have been to Malaysia like umpteen times but necer heard of this and no one seems to talk about them. I just book marked your article for use when I go there the next time. Thanks . I think many Malaysians might have seen the Mah Meris performing their traditional dances at some events but they just lump them together with other groups of aborigines. I myself was not aware of them until just a few years back. Anyway, getting here is a bit tricky if you don't have your own transport (or rental car) but I do believe there are tour packages from KL that include a visit to the island. How fascinating...did you feel like they've been able to stay true to their culture and heritage? Or can you see the outside world seeping in? I was surprised to see a violin in one of the photos, as that is certainly not native. Hi, Tami! I was surprised too about the violin but didn't get to ask them about it, haha! In general, I believe they're trying their best to preserve their culture & heritage while at the same time embracing modernity. For example, those traditional dresses are mostly worn for ceremonial purposes only. Their houses are mostly typical of kampong houses, they own cars and ride motorcycles and stuff. At the same time however, they're keeping their other traditions and beliefs close to heart. Thank you for the great tips! I really had no idea about this culture before now, so thanks for the introduction! I'm always amazed about the fascinating history and cultures from around the world. Thanks, Lauren. I love it when I can learn a thing or two about local cultures whenever I travel. I should really expand this interest to include the various cultures in my country too. Great photos. I love to learn about the history and culture of a destination. This kind of trip would be right up my alley. I think it's nice that they pay homage to their ancestors through such a creative way. Thanks, Kim. Yes, I'd love to check out their Hari Moyang - Ancestors' Day - which is taking place in a month or so. I knew pretty much nothing about Mah Meri before reading this! Thank you for sharing their wonderful culture. I'd love to see them perform their traditional dance! Hi Carmen, whenever they perform a dance at a festival or parade in Kuala Lumpur (or elsewhere for that matter), they'd always get the extra attention because their performance is simply different from the rest. You should check it out on YouTube. Wow this is fantastic, we've been thinking about KL for later this year because we can get direct flights, so have been having a look around at what we can do while there. I would definitely rent a car and make the 2 hour drive to visit the Mah Meri tribe ... thanks for the tips and the insight! Hi Megan, if you love this kind of things, I'm sure it would be a worthwhile trip out of KL. Definitely recommended! Very nice picture and descriptions. Terima kasih! Bila lagi ke KL? Thanks. Personally I'd love to go and visit the place again soon. Thanks! It's a very interesting encounter indeed for me. Ah-ha! If you are interested in seeing this kind of culture, you should! It's a bit tricky however to get there because there's hardly any public transportation option available. Most visitors either rent a car or take a package tour. Do you have any travel recommendation for this? I mean beside contact(the mah Meri) them. I think it really depends on the budget. It's probably cheaper to travel there by train+taxi but it would be a lot more convenient if you take a package with an agency that offers a tour here. + you get the benefit of a guide. However, if you just want to watch their dances & performance, you can try to time your visit to KL around Citrawarna parade/event. Very nice pics and informative post. Thank you so much for sharing it.